Robert N. Giaimo (D-CT) was a member of the 86th-96th Congresses from the Third District of Connecticut (New Haven area) from 1958-1980. Giaimo served on the Housing and Urban Development subcommittee of the House Appropriations Committee in the 1960s. This press release discusses the Demonstration Cities Program. Giaimo, Robert N. "Press Release from Congressman Robert Giaimo on the Demonstration Cities Program." 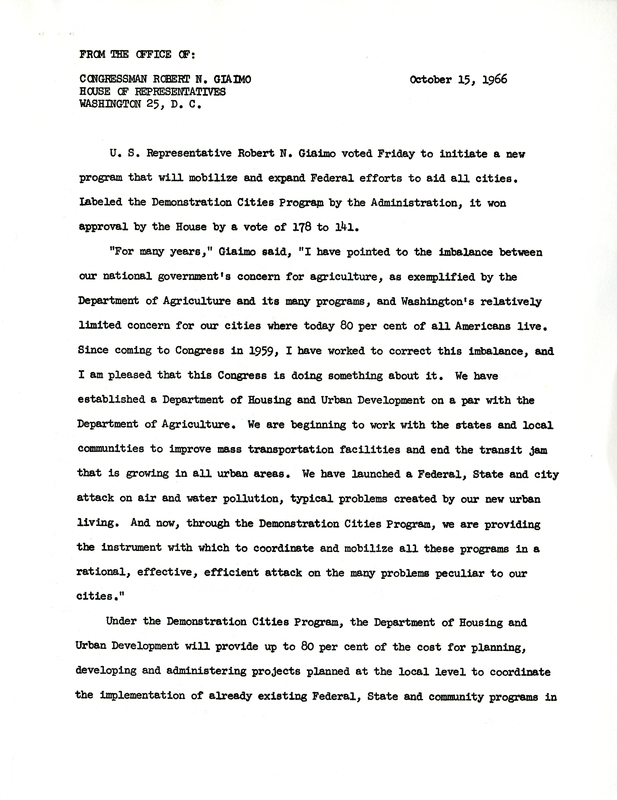 Robert N. Giaimo Papers, Series VI: Press Releases and Statements, Demonstration Cities Bill, Box 178, Thomas J. Dodd Research Center. Accessed 19 April 2019. http://acsc.lib.udel.edu/items/show/471.